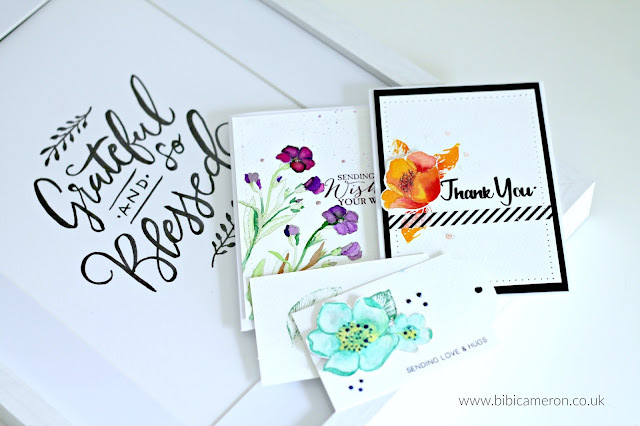 My Stampin Up Farewell | Hello Tonic Studios GIVEAWAY! Today is my farewell as Stampin' Up! Demonstrator... I'm not really saying goodbye to Stampin' Up! products as they will be always part of my stamping adventures! And I'm also saying hello to Concord & 9th, Neat and Tangled and Tonic Studios! I mixed and matched products to make a very small collection of projects using 1 of the products in the giveaway . This is a collection of aqua pens, 12 intense colours perfect to apply a variety of techniques. I also made 3 videos to demonstrate some techniques... but just a few as the possibilities for card making and mix media are endless. Using the black Aqua Flow pen I had my first time hand lettering ... good enough for someone who depends on PCs to write everything. Watch video to see how I made it? I use a light box and trace the image on watercolour paper... Yes!!! I have cheated a little bit but that is the price to pay when you are so bad at hand writing. I also tested the pens to applying easy watercolor techniques... they works like butter! I'm feeling grateful and blessed for having the opportunity to share with the Satmpin' Up! family 27 exciting months . I owe Staminp' Up! one of the best experience that any crafter can have, any papercraft lover will be proud of having such amazing school. I have to be honest as Stampin' Up! taught me, shared with me the very best in terms of stamping, they create a good atmosphere for Demonstrators, they offer career opportunities like no others. However, I had to make a very hard decision and I dropped my Stampin' Up! Demonstratorship voluntarily last Monday February 6 - 2017 . 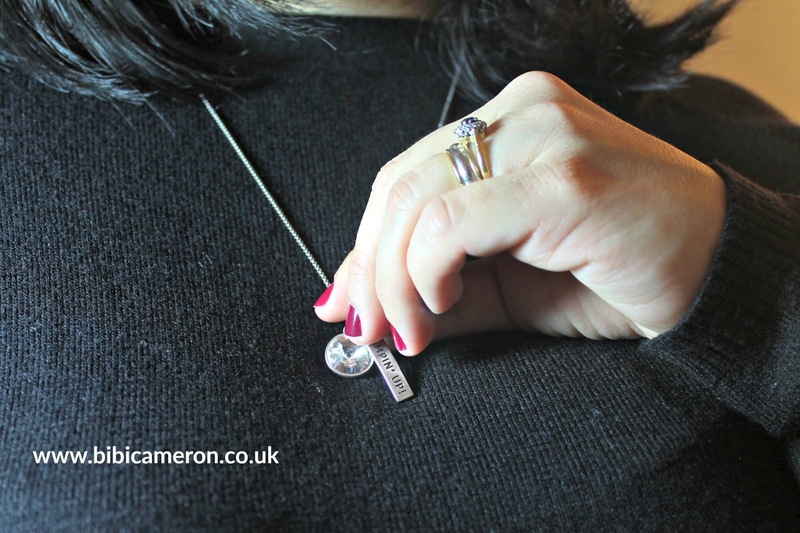 My reasons to drop Stampin' Up! I have been seduced by other brands, stamps and other craft supplies too !! PLOP!!!! and my beloved Stampin' Up! do not accept a third party in their relationships with Demonstrators. That's why! For those who doesn't know what I'm talking about, Stampin' Up! have a policy in which Demonstrators can't promote any product or activity related to competitive brands ( blog hops, collaborations, publications, product reviews, etc) There are exception for those Demonstrators who are members of Design Teams for other companies but they can only receive products in compensation for their work and not payments in return. I think that as a crafter I have the right to use, promote and make reviews of any products I use and I love, no always looking for a compensation... I want to be able to mention them and share about them as well. I also think that is fair enough that a creative person can make a living from their art, and get compensation for the hard work and ideas and of course for the time and experience. At some point I though that these and other restrictions in the Stampin Up Demonstrator Agreement goes beyond of what I was keen to accept in first place. I accepted it and lived whit that the last 2 years but is time for me to fly! That's all! I hope you enjoy the projects, the videos and the giveaway. For the chance to win Novo Aqua Pen Collection simple leave a comment below this post. For the chance to win Tonic A3 glass Mat simply submit your entry by clicking "HERE "
Any brand is accepted . Use your favourite! Once you add your link your project will automatically appear in my blog page and people can vote for you to win. The winner will be the one with more votes. Everybody have 3 votes to give to their favourite projects. Test your link and make sure it is working as broken links can't participate. Giveaway closes on March 5 - 2017. Winners will be announced on March 6 - 2017 here in my blog. Please check the winners blog post that day to claim your prize. I like to use other company's products as well. That's why I'm just an occasional hobby demo with Stampin' Up! Using the light box is a very clever idea. I would love to win a set of these pens. Fingers crossed and thank you for the opportunity to win. 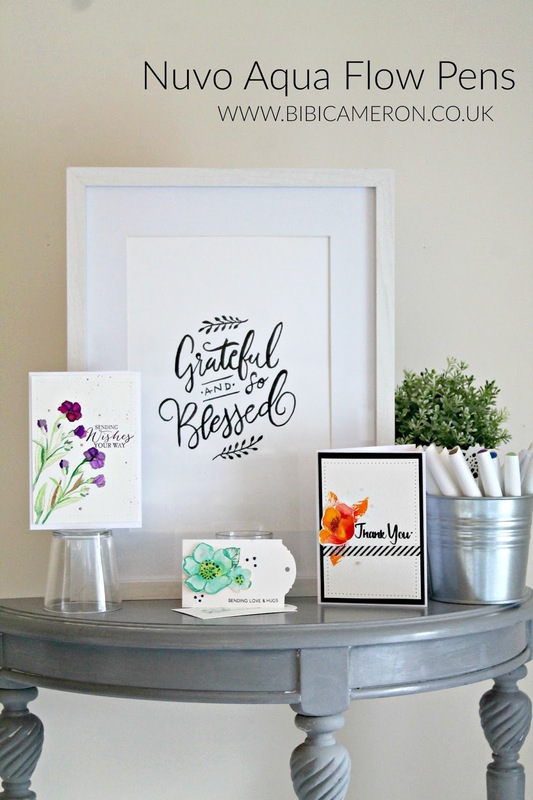 Your beautiful work with Stampin' Up! will be greatly missed Bibi but I can't wait to see all the new gorgeous projects you will be bringing us in the future. Thank you for a chance to win!! I ALWAYS enjoy your projects. ..Thank you! Great ideas. Love the mixing of the tonic aqua pens! The effect is mesmerizing! I tried to leave a comment before but it didn't work! Thank you for a chance to win! I love your projects you share with us! Hi Bibi, i have always loved your videos and could watch them for hours. You are such a fantastic artist and i totally understand your reasons for leaving Stampin' Up! I'm pleased you re still using their stamps though. Butterfly Basics has to be one of my most favourite stamp sets and i just love the card you have made. I would certainly love to be in with a chance of winning some new pens to try out. You make them look so easy to use. Not sure my results would be as good as yours! Beautiful lettering!! Thanks for sharing the video tutorial and the generous giveaway. I love to listen to your videos and have been learning so much about this art form. Thank you for the opportunity to win and this time I have to say...PICK ME! They look so cool and we have no shops for over 100 miles! Thanks again and good luck to everyone! Will miss you, Onstage last April with you and Gosia was lovely, shame you won't be at future events. Your creations are fabulous, and I know that there will be many more fabulous creations to come. I have not yet tried the Novo Aqua Pen so having an opportunity to win a Collection would be fantastic. I live in NZ and am looking forward to seeing what new ideas you come up with when using mixed products. Fantastic! I am so excited to hear that you will be expanding your horizons in your craft!!! I love your designs and will follow you through your new adventures :) The nuvo aqua flow pens would be great coloring my stampscapes scenes.......oooooh the possibilities are endles! As always your cards are nothing short of AMAZING!!!!!! Wishing you a journey full of success! i just recently found your blog and have been watching your videos. Love all of the wonderful coloring tips you share.......your cards are beautiful. I would love to win the Nuvo Aqua Pens. Thanks for sharing. I love your work and I can understand your reasoning. Wishing you the best. I will love to see you doing some tutorials on Hand Lettering. It is one of those "I want to learn to do that" goal of mine. Thanks! You are so talented, keep up the videos. We appreciate all your hard work, and I agree; you should get paid for your GORGEOUS work. What a beautiful cards!! I have always enjoyed watching your videos. I will miss seen your projects using Stampin'Up! products. Best wishes for your new venture! Thank you for the chance to win! Love your work, have learnt so much from you! Thank you for the giveaway! Congratulations. And selfishly delighted that you are continuing in the paper crafts. Creative expression with open boundaries is both natural and healthy. Soar high and with joy! Congratulations! Very excited to learn about new products and creative ways to integrate multiple platforms with you. This is so very exciting. Best wishes on this healthy next step ... May you soar with joy and artistic inspiration. Those Nuevo pens look great! Thank you for the opportunity to try them. Good luck with everything! Looking forward to your projects using other brands. 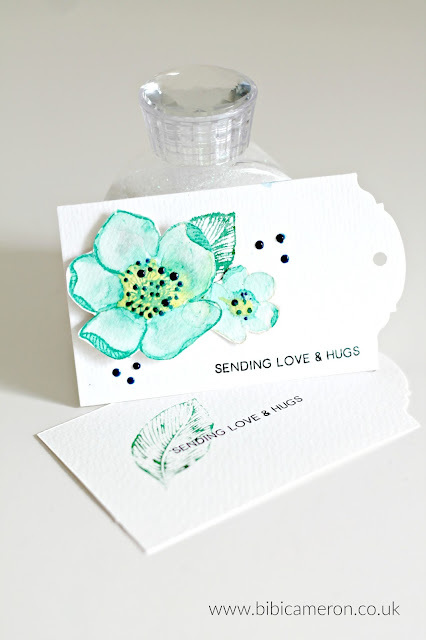 Thank you for sharing such great tips using the Nuvo Aqua Flow Pens - they look fabulous! Wishing you success as you fly out of the Stamping' Up nest and try new products. I can't wait to see what you have in store for us! When you first announced that were leaving Stampin' Up I was hoping that you were going to stay in the industry. So Happy that you will be. Excited for you. Can't wait to watch you on your new journey. Congrats on your decision to expand your designing to include brands from many different companies! I loved your videos and would love to win the Aqua Pens after watching your coloring with them! I am sad that you are no longer a SU Demo and that we didn't get to meet at On Stage last November. You are a very talented lady and I know you will do well in your new venture. I will be following your journey and hope we keep in touch. Love all your projects and thank you for this super Giveaway. I love your tutorials. glad to hear that your not leaving the craft industry just spreading your wings. I would love to win the aqua markers. thanks for the chance. So excited about the aquaflow pens. What website sells them? Thanks and the best to you on your new endeavors! God bless. Your cards are fabulous! Love the coloring technique you showed on the video, and can't wait to try it! The pens look fabulous. Thanks for a chance to win the giveaway! I first watched your waterfall card tutorial and I really enjoyed it so I subscribed to your YouTube channel. The aqua pen technique is nice and you make it look easy. I admire your choice to follow your principles with regard to crafting and I wish you well going forward. I also look forward to future YouTube tutorials. I am glad that you are continuing with your videos. I love your talent and you are so inspirational. Two of my favorites have been the purses and the felt book. I look forward to more inspiration from you as you begin your new adventure. Already have most of the Nuvo Crystal Drops collection (including glitter) but I would love to add the Nuvo Aqua markers as well. I enjoyed your video. Good luck on your new venture with Nuvo. Your flowers are amazing. I am going to try your technique. You really have talent. Look forward to your new adventures. Beautiful cards as always! The ink colors look amazing and I would love the chance to win, thank you! The Nuvo Aqua markers look like so much fun to play with! Thanks for the giveaway! I wouldn't do without my tonic glass mat, the pens are defiantly on my wish list. Just found your blog and know I'm going to be a regular now. Hi Bibi. Like you I was a stampin up demonstrator but I do like other products. I love your tutorials and have learned more from watching you than I have from other stampin up tutorials. I made a few of your purses for my granddaughters birthdays and they asked for more to give to their friends for their birthdays. Thank you for sharing and I am really interested in your new watercolour pen sets. Hi Bibi. Like you I was a stampin up demonstrator but I too like other products. I have watched and learned from your tutorials so very many things such as your purse, your different folds and beautiful cards. I love your new watercolour pens as I love to watercolour. I am using pencils but would like to learn more about your new techniques with these pens. Thank you for sharing your talent with all of us. What a great product. Hope to win. Thanks for showing us. i don't blame you...there are so many good products out there! Sad to hear you've left SU, but excited for your new creative venture!! The paper craft industry is pretty amazing these days! I look forward to seeing what you've come up with!! These pens look amazing and would love to try to win! I've been dabbling in lettering myself lately! Looks like I can learn a lot from you and your techniques. Will certainly watching you videos on YouTube! Love these pens Bibi! You are so creative and I always enjoy your videos! Sorry to hear you've moved on from SU but I'm excited for you and I look forward to your next creative ventures! Bibi you are so talented! Thanks for sharing inspiration with us! Would love to win the Novo aqua pens! Thanks! Bibi, I was researching the Nuvo pens, on YouTube, and your videos came up. I was happy to subscribe because I love seeing new ideas. Thank you so much for sharing. Your projects are beautiful. I am just seeing the Nuvo pens in action watching your videos. These aqua pens look great. I would love to try them! Bibi, I am sad to see you leave Stampin' Up! and I completely understand. You have huge talent and I look forward to being inspired through new products. I too enjoy the products of other companies. Congratulations on your new journey. I have seen your videos! And you are amazing! I would love to have those pens for practice and do things like you do! I really liked the post! To say the truth, the photo of your cards made me to visit your blog! Great job!!! :) Really beautiful!!! The Aqua pens look really interesting. Would really enjoy trying them. Thank u!! Love your cards and techniques! Love watching your videos! Hi. Thank you for the giveaway. love Nuvo products. I love your work and you are very gifted! Looking forward to more of your videos. Beautiful work and thank you for the great video demonstrating the aqua flow pens! Thank you for the giveaway! I love the cards you have made with these pens. Great blog. Love your ideas. I think you made the right decision to cgange companies to fulfill your talents. Would love to win the Aqua pens. I have just started learning to do Calligraphy and the pens would be great. Love the colors. Thank you so much for your videos and the giveaway! 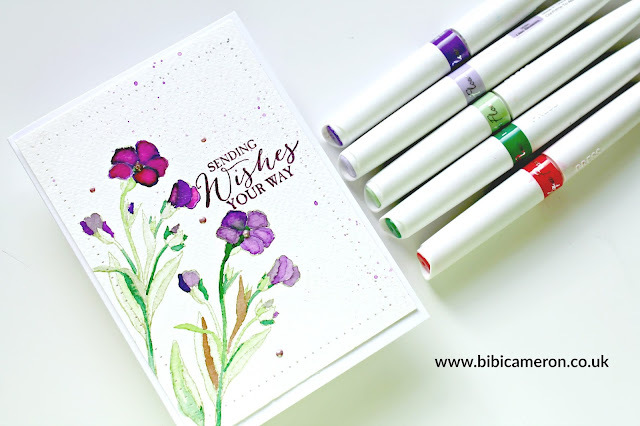 Your cards are so beautiful and the Aqua Markers look super fun! How exciting to be starting a new adventure!! Best wishes and I am looking forward to seeing your work! Bibi, thanks for showing us such an awesome technique! I really learn so much from your videos, thank you! I have never seen these. You make it look so easy and I love your cards. I need you tips on taking photos, these look like they should be in a magazine, lol. Thank you for showing your pretty cards and some great techniques! These pens look like lots of fun. It would be great to try the pens. I'd have to win them first. Thanks for the opportunity. Those pens look fabulous! Your cards are beautiful and I really enjoyed the videos. Thanks to you and Tonic for the chance to win those beauties! Just found your site and love watching you demonstrate the pens!! The aqua flow pens look amazing! I do understand your situation, but we miss you Bibi! Your crafts are so awesome - I just stumbled upon your video this morning and have been looking at such a variety of crafts!! You're AWESEOME! Best of luck on your new adventure!! I'm sure it's too late to enter, but thought I'd let you know that I'm happy you costed this. I've been wondering how these pens work! I couldn’t resist commenting. Well written! Never get lost in Hookup Sites.